How to Choose a PC: Commercial, Industrial or Rugged? A couple of months ago, Logic Supply released a new way to shop for and purchase products on our website. We introduced three distinct product lines that allow you to quickly find the perfect computer for your needs. We called these lines Commercial, Industrial and Rugged. Each offers systems that have unique features perfectly tailored for specific applications. Breaking out our pre-configured PC’s into these lines solves a key problem many of our customers were having; selection overload. Logic Supply has computers that cater to a wide range of applications, enabling us to offer the right solution for everyone. However, for some, this made it a bit challenging to find the ideal industrial computer as quickly as possible. Our three lines resolve this by offering specially designed computers built in response to customer feedback about their specific needs. We used the personal experiences of our clients to help shape each configuration and line. Customers now have an easy starting point built around their need for a Commercial, Industrial or Rugged computer, vastly decreasing the time it takes to find the right solution. But what defines each line, and what unique advantages do they offer users? Our Commercial Line comprises affordable and powerful computers that use our custom engineered, fanned enclosures. These systems are perfect for controlled environments like offices, server rooms, point of sale installations and any other application in which environmental factors are not of particular concern. Our Commercial Line ranges from the affordable and efficient MC500B-10 to the powerful and versatile MC600B-50 with Haswell processing and PCIe x16 expansion. All of our commercial computers feature our signature space saving design and optimized cooling with highly efficient MagLev fans. The Industrial Line is where our fanless computers live. These computers are protected from dust, debris and other particulates that clog fanned computers and damage internal components. Included in the Industrial Line is our popular ML300 series. 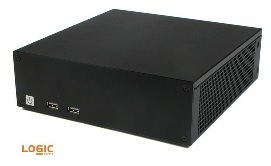 Based off the Intel NUC standard, these fanless computers are perfect in a wide variety of manufacturing, production and industrial workstation applications. Much like all of the Industrial Line, the ML300 is perfect for shop floors, digital signage, manufacturing workstations as well as embedded computing. 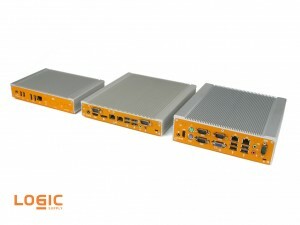 Also featured in the Industrial Line is the sleek ML400 and our new ML210G-10-TR, a ThinManager-ready® thin client that combines Logic Supply precision engineering with ThinManager’s industry leading virtualization management features. The Industrial Line helps prevent downtime and increase reliability by eliminating a common failure point in the vast majority of today’s computers, fans. Here at Logic Supply we like to say that the future looks brighter in orange, and the success our clients have found with our Industrial Line of fanless PCs is a testament to that. Our Rugged Line is unique in that it features hardware from a carefully-selected group of manufacturing partners. In addition to a number of upcoming Logic Supply engineered systems, the Rugged Line features units from manufacturers Cincoze and Neousys. These two companies design and engineer computers ready to withstand harsh environments that would destroy typical hardware. With hardened enclosures and custom circuitry, these high-end computers are a must have for applications that live in unpredictable, difficult and vibration prone places like trains, automobiles or boats. 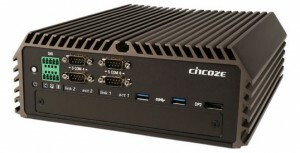 Included in the Rugged line is the new DS series from Cincoze. With desktop class Haswell processors, cable-free construction and a wide array of I/O and features, the DS series innovates on the Rugged computer. Choosing the ideal PC for your particular project isn’t a simple task, but in dividing our product offerings into these three distinct categories we hope we’ve provided a good starting point. Of course, the easiest way to ensure the computer you choose is perfectly suited to your needs is by speaking with one of our solutions specialists by calling +1 802 861 2300 (in the US) or +31 85 2733760 (in the EU). 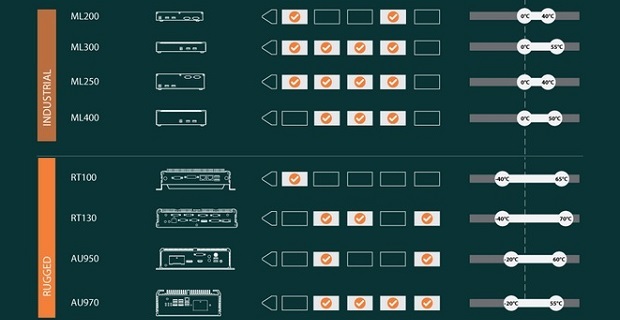 We can help you choose the Line, Series and Model to get your project up and running in no time.